Buy this "One of kind" Imperfect Red at very Reasonable price from Rugs and Beyond. Decorate your home with this "One of a kind" Hand knotted woolen carpet. This carpet is specially designed for a modern home decor. It has taken 9-10 months to weave. The material for this carpet is used including New Zealand wool with Bamboo Silk and Cotton material. 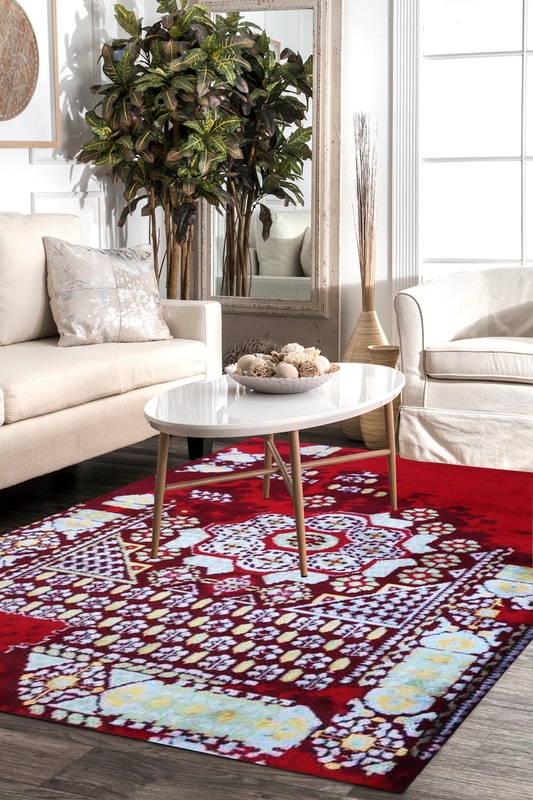 With the perfect shades of red and white color with different suitable and matching colors like sea green and yellow, this pure New Zealand wool, bamboo silk and finest quality of cotton rug from India is hand-knotted beautifully to give your living area a lavish and magnificent look. With the luxury of modern art, this rug from India is sure will make a unique attraction for your guests. Buy this pure wool area rug from Rugs and Beyond at cheaper price. - Warp- Cotton Back looks just like front due to the intricacy of craftsmanship and fineness.